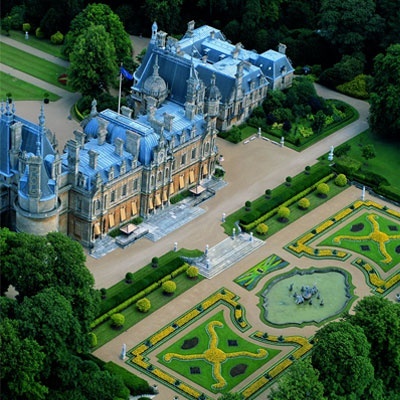 Waddesdon Manor is a country house in the village of Waddesdon, in Buckinghamshire, England. The house was built in the Neo-Renaissance style of a French château between 1874 and 1889 for Baron Ferdinand de Rothschild (1839–1898). Since this was the preferred style of the Rothschilds it became also known as the Goût Rothschild. The house, set in formal gardens and an English landscape park, was built on a barren hilltop overlooking Waddesdon village. The last member of the Rothschild family to own Waddesdon was James de Rothschild. He bequeathed the house and its contents to the National Trust in 1957. Today, following an extensive restoration, it is administered by a Rothschild charitable trust that is overseen by Jacob Rothschild, 4th Baron Rothschild. In 2007–08 it was the National Trust's second most visited paid-entry property, with 386,544 visitors.